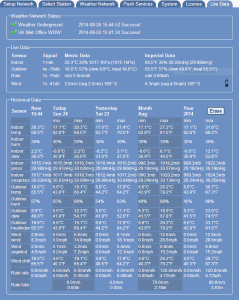 All of the SB software products (MeteoBridge, MeteoHub and MeteoPlug) are written to run on tiny, self-contained and cheap Linux-based computers, which are are affordable to use as a dedicated weather computer and which use so little power that they can be left running 24/7 without worry. MeteoBridge — MeteoBridge provides an easy-to-use unit for uploading live weather data to communities such as WOW and Wunderground, but also provides advanced features for more experienced users, including website uploads, sophisticated alarms, email, Twitter, webcam uploads etc. The original standard MeteoBridge has been largely superseded by the Pro version (see below). We no longer sell the standard MB unit but interested users can still build their own standard MB by following instructions on the Smartbedded site (but please be sure that you have a compatible version of your proposed host hardware). Information about the basic MB has been retained below as a general introduction to MB functionality. MeteoBridge Nano and Nano SD New This is a great new member of the MeteoBridge family which includes all of the standard Meteobridge software features in a logger-sized module AND includes WiFi communication with your domestic or office WiFi network. 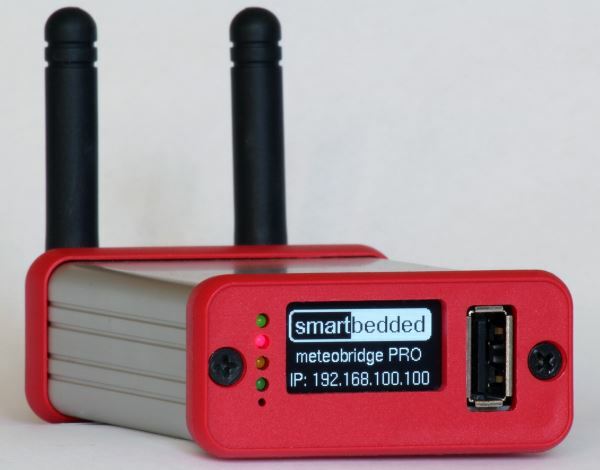 MeteoBridge Pro Basic functions are similar to standard MeteoBridge but with many additional enhancements and features, including a MeteoBridge Pro Red version which contains full receiver circuitry for Davis wireless transmitters (MeteoStick is effectively built in). MeteoStick is a novel hardware product. It is a wireless receiver for weather data specifically from Davis wireless weather sensor transmitters, manufactured in the form factor of a USB stick and is a product which offers some unique data handling features. This is a great new member of the MeteoBridge family which includes all of the standard Meteobridge software features in a logger-sized module AND includes WiFi communication with your domestic or office WiFi network. The Meteobridge NANO is a tiny plug-in device that dramatically extends the features of your Davis Instruments® Vantage Pro2™ or Vue™ weather station. The NANO is simply plugged in the expansion connector underneath the battery cover on the back of the console and in exactly the same way as a standard logger. When you close the back cover again this upgrade is completely invisible. 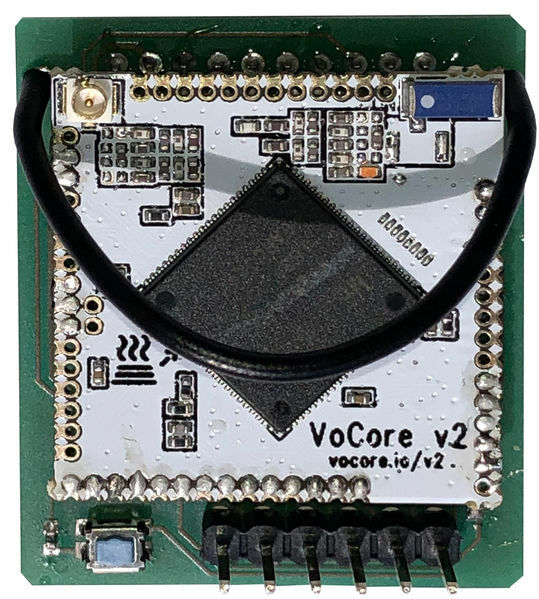 The NANO adds a full Meteobridge feature-set to your weather station setup which includes many extra services for which you usually need a full PC solution. The NANO just takes about 1 watt of energy and therefore is dramatically more power efficient than using a PC and more convenient to use than even a Raspberry Pi. Further details can be found in the Nano datasheet (which also provides details of the Meteobridge services available from Nano) and in the Nano install manual. More description of Meteobridge services will also be found below. Nano was designed with the capability to accept a special SD card for long-term data storage although this feature has only recently been disclosed. From March 2019 we will be offering both the standard Nano (no SD card) and Nano SD (SD card pre-fitted) as separate products. Nano SD adds considerably to the capabilities of a Vue or VP2 console to act as a standalone device for recording weather data as explained in more detail on the Smartbedded site at: www.meteobridge.com/wiki/index.php/Meteobridge_NANO_SD. Important: You cannot use a regular SD card with Nano SD – it must be a special industrial SD card with exceptional durability that minimises the risk of data loss. This accounts for the significant extra cost of the Nano SD product. Nano vs WFL: As a logger communicating (only) over WiFi, the MB Nano product is similar in some respects to the WFL WiFi logger and it’s an obvious question as to how the two devices compare. Each has pros and cons and each has certain unique features; potential users will need to explore the features of each in more detail and reach their own conclusion as to which device better fits their needs. However, in a nutshell, WFL is simpler and cheaper, but with significant limitations to its capabilities. Nano is somewhat higher-priced but has substantially more powerful data handling features built-in. Either can be used in simple, standalone installations, such as simply uploading to weather networks like Weather Underground. But for more advanced applications, WFL would typically be used with software running on an external computer (albeit with full flexibility as to the choice of software to be used), whereas Nano is designed to deliver many advanced features direct from the built-in Meteobridge software and without necessarily needing additional support from an external computer. Some additional comments on WFL vs Nano will be found in the WFL FAQ section. Available in two models: Black (standard) and Red with built-in MeteoStick circuitry allowing direct reception of data from Davis wireless transmitters. See the standard MB description below for an overview of MB features. Overall, the main functional advantage of MB Pro is its greater computing capability made possible by the much larger memory, which gives it the potential to perform many tasks beyond the reach of the original MB. It will take a little time before the software potential of the Pro is fully exploited, but updates to the MB Pro’s software are free and automatic (on reboot). And as the Pro’s user community expands, so will the range of novel applications and downloadable templates & other community resources also doubtless grow. Further details can be found in the MeteoBridge Pro datasheet and in the MeteoBridge Pro manual. NB The standard Meteobridge unit has been largely replaced by the Pro unit above, especially the Pro Red. We no longer sell the standard MB – anyone still wanting one will find it more cost-effective to make their own, purchasing a firmware download from the MB website. MeteoBridge (MB) is a Linux software program which is sold pre-installed on a tiny Linux computer (see image right for a typical MB device – this one is about 3″ (70mm) square to give an idea of size). So, when buying MeteoBridge you’re effectively buying a small, hardware device, dedicated to running the MB software. (Don’t be put off by the mention of Linux – you need to know absolutely nothing about Linux to use an MB unit. All MB configuration is done using a web interface – see below). The MB device is a tiny, low power-consumption unit that, once the initial set-up is complete, does not need any routine attention – whenever you power up or reboot the unit, it will restart the MB software automatically and will resume performing the uploads previously configured. It should therefore operate almost as a zero-maintenance unit (other than on occasions when you might choose to change its settings) being left on 24/7 and using so little power as to be negligible, simply working away in the background and performing all your Internet weather uploads. Note also that the MB unit is WiFi enabled and so provides a way of connecting your weather data into your home or office network via WiFi. The MB unit receives its data input from your weather station console (or data logger) via a USB connection and its output is then connected onwards to your Internet connection either via a cabled connection or via WiFi. When using MB, no USB connection to a separate PC or other computer is needed. MeteoBridge is compatible with many common makes of weather station, including Davis, Oregon, Fine Offset (Maplin) etc. For a full list of compatible models, please check this link. 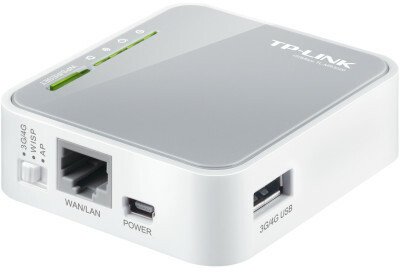 Note that the USB input and network output are the only cable connections that need to be made to the MB device (other than a power cable from the AC mains adapter). No keyboard, mouse or monitor connections are needed at all. Instead, any changes that may occasionally be needed to the MB settings are made via any other PC or tablet on your network via a simple web browser interface – see image right (click for a larger version). This image shows the ‘Live Data’ tab enabled, but the other tab options can be seen across the top of the image. Set sophisticated alarm/alert thresholds with notifications by email or text message. These Push Services are a powerful and sophisticated feature and in the hands of an interested user permit a wide range of advanced applications to be developed, giving some features that are simply not readily possible with other software. Further details about these Push Services can be found in the MeteoBridge wiki. Alternatively, prospective buyers can contact us with any specific questions. MeteoStick is manufactured in the form of a transparent USB memory stick (see image below right – click to enlarge) and therefore simply needs to plug into the USB socket on a PC or other small computer in order to provide a data feed to the computer and also to draw power for itself. The orange element to the right of the MS unit is an external stiff wire antenna. The MS unit can also be plugged into a cabled USB socket (see left), which will achieve the best wireless range because the MS is removed from the immediate vicinity of the computer. MeteoStick clearly does not have a display of its own and so can only act as a data receiver when connected to a computer. In this sense, it offers comparable capabilities to a Davis Envoy console, but note that it plugs directly into a computer (or USB socket) and so replaces both Envoy and the Weatherlink logger that would otherwise be required for connecting Envoy and PC. We do also expect that other established software programs are likely to add support for MS in the coming months.